Submersible dewatering pumps are lightweight, portable pumps commonly used to drain raw and dirty water. Dewatering pumps are often used in construction sites, excavation sites, industrial plants, mines and in flooded basements. They can also be used to circulate fountain water. Many of the featured pumps include accessories such as engines and suction strainers. 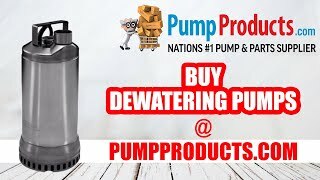 PumpProducts.com offers dewatering pumps from manufacturers such as Barnes and Goulds.